The GearWrench Mini Diagonal Cutting Pliers feature a slim head design, a solid flush rivet for better access and tighter tolerance, slim handle design recessed at the top, and spring keeps handles open. 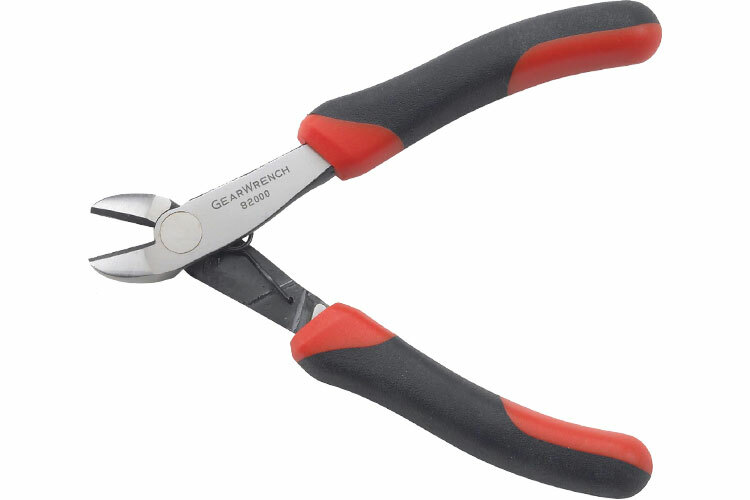 The 82000D GearWrench Mini Diagonal Cutting Pliers is one of thousands of quality tooling products available from MRO Tools. Please browse GearWrench Mini Pliers for tools similar to the 82000D GearWrench Mini Diagonal Cutting Pliers. 82000D GearWrench Mini Diagonal Cutting Pliers description summary: GearWrench mini diagonal cutting pliers. Application: Mini Overall Length: 4.45'' Jaw Length: 0.51'' Jaw Width: 0.33'' Jaw Thickness: 0.51'' Cut Capacity: Mini Cutting Edge Length: 0.51'' Quantity discounts may be available for the 82000D GearWrench Mini Diagonal Cutting Pliers. Please contact MRO Tools for details.